Award winning author, illustrator and artist Catherine Rayner is best known for her animated depictions of wild and domestic animals, showing off the charisma and character of these creatures that many of us take for granted. Catherine Rayner has been exhibiting at Sarah Wiseman Gallery for ten years and in that time we've been thrilled to see the leaps her career has taken. Using liquid acrylics and silkscreen her lively and expressive line describes movement whilst playing with scale and space. By placing the animal to one side of the paper, for example, she suggests that it has just strayed into the frame and at any moment might just wander off again. Her silkscreens are made expressively and organically often including up to thirty layers of colour. Her experience as a children's book illustrator allows the viewer to observe each creature and imagine the events in its life. Its posture, pose and curious expression has a poignancy and a sense of anticipation as in a new story unfolding. More recently, Catherine has included carefully placed leaves and grasses or footprints to build even more of a sense of scale and backdrop. 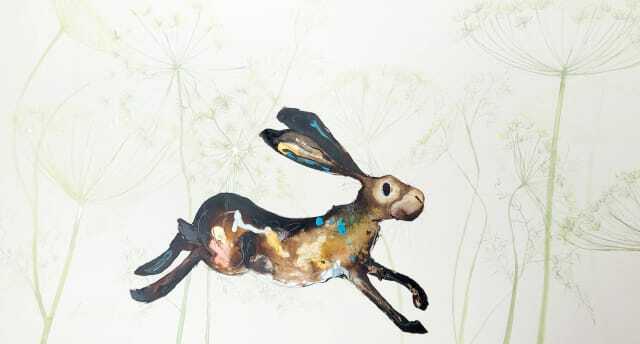 Catherine Rayner graduated in 2004 from Edinburgh College of Art where she studied Illustration. She published her first picture book 'Augustus and His Smile' in 2006. She won the Best New Illustrator Award at the Booktrust Early Years Awards and was also shortlisted for the V&A Illustration Awards in that same year. Since that time she has published around a dozen picture books for children,in her own right, as well as collaborating with other writers. Amongst numerous other prizes and nominations she was the recipient of the prestigious Kate Greenaway Medal in 2009 for her book 'Harris Finds His Feet'. Her work has been exhibited all around the UK and is in numerous private collections. Catherine lives and works in Edinburgh.